I own three cars, have 7 bank accounts in 3 countries, and just made $5,000 in 1 week while off traveling the world. And I walked around town with $10,000 USD worth of cash in my pocket. But before you think I'm rich and conceited, what if I said one of those cars, my brand new Jeep Liberty I was shipping to Iceland, is wrecked and totaled? "...Yeah, rich, conceited, and out of control too...," you say. I do seem to go through cars pretty fast (the value of my car in Patagonia last year dropped almost in half in 6 months) but this is a new record. Let's go back a few days, to when my Jeep was sitting in a container in the shipyard waiting for its number plates to arrive by FedEx from the USA so could avoid import taxes. 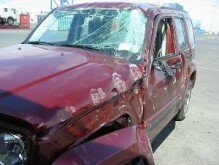 One evening, I get an email from an Eimskip employee who said, "Dear sir, Unfortunately the container containing Jeep Liberty car VIN#1J8GN28K68W287265, did shift in strong wind here in Reykjavík last night and car was damaged." I thought, "Well, a couple scratches on the side door from where it got bumped shouldn't be a big deal. I'll just use the car, get a few more scratches on it (like I always do) while four-wheeling in the highland of Iceland, and get the door fixed back in the USA at Eimskip's cost." Err, no. Take a look at the photos. It "did shift" all right. I got to watch the CCTV security camera footage of the dock yard; in the foreground, a tarp over a shipping container is flapping wildly in the wind, and in the background, there's a stack of containers just 2 high. CCTV has less than the 30 frames/second, I think more like 5 or 10 fps, so one second I'm just staring at the stack of containers, and the next instant, the top container is on the ground in front of the other ones. It looked quite funny, like an invisible hand just flicked over a little block. What's not funny is that my car was inside that tumbling container. Fortunately, the contents of the container were insured. I was very blessed to receive from the Icelandic insurance company the full retail value of the brand new car, without all those year-end manufacturer rebates factored in, or the fact that once you drive a car off the dealer lot, it loses up to 10% of its value (hence the $5000 ‘profit’). But settling an insurance claim like this takes a couple weeks. So I was ‘stuck’ in Reykjavík for the most part. Well, other people just rent a car, hitchhike, or take buses around, but I didn’t travel too far because I kept thinking any day now the case would be settled, and every other day I had to be in the city to do some paperwork or provide information or something. The insurance agency didn’t want to claim the damaged vehicle for themselves after paying for it, so I retained ownership of it. So I ended up listing it on Ebay, and it sold for over $2000 to a US buyer since it has a brand new engine and one might be able to repair the car for less than the cost of a new one. I didn’t make much money on this transaction, however, since I had to ship it back to the USA for about the same cost. This time I told them to skip the insurance coverage on shipping. I was leaving on an 8 day hiking trip on the opposite side of the country just when I got the bill for this latest shipment, the due date was a week later, and Eimskip had to physically swipe a card for payment and not just take a credit card number over the phone, so I was in trouble. I ended up giving my card to a random woman at a library and asked her to buy a stamp and mail it for me on Monday (today was Saturday), to one of my friends that works at Eimskip, and asked if they'd bring the card up to the correct payment desk and forge my name on the $2000 receipt for me. (fortunately knowing everyone there from all my time at the offices of Eimskip has its benefits, but when you start dating an Eimskip employee, you know for sure you’re spending way too much time at the office). I brought over some additional camping/outdoor stuff in my vehicle, that I couldn’t squeeze into my two 50 lb. checked bags on the airplane, or my 50 lbs. (instead of the limit of ~15 of carry on items that I pretend to carry as if they’re light as a feather so no one asks to actually weight my carry on). So, I went to the port and asked my friends at Eimskip if I could go to my vehicle in the dockyard and take out my personal items from the vehicle. 20 minutes later, a customs vehicle pulls up and 3 tough looking customs agents tell me to get in. We drive through the dockyard, eventually find the right container, and 3 Eimskip dock workers and the 3 customs agents all watch me as I start rummaging through the car and pulling out freeze dried meals, a snowboard, ropes, clothes, etc. After the 20th freeze dried food package gets tossed out the shattered window, I start worrying the customs guys will think there’s got to be something a little more than food in those sealed packages. And I also start thinking how many man-hours of labour I am taking up, employing 6 men to watch me. Fortunately, I was never charged for taking a disproportional amount of employee time, or ‘storing’ my car on the docks for over a month. It was most convenient to open a bank account here in Iceland to receive the payment for the car, (plus I get this nifty debit card that makes people assume I’m Icelandic, and now I have no more foreign transaction fees on my other credit cards). I ended up using $7500 of the settlement money to buy a used Nissan SUV 4wheel drive car here – so I got my Icelandic number plates after all, and briefly owned 3 cars at once. It's a gas-guzzler all right, getting only 8 km/liter, but I've forded deep rocky rivers with no problems with this hardy car. (well, maybe I should've bought a smaller SUV, especially since gas went up 40% overnight up to 184 kr / liter (~$6USD/gal.) the week after I bought my car, but I made the best decision given the information available at the time). Buying was quite easy (especially when carrying a $10k wad of cash with you), after I had obtained my Kennitala identification number from the government. Costs (for foreigners) are now about half of what they were before the Icelandic Kronur fell in value, so buying a used car here now makes economic sense. I just hope I can sell it. And holding a large bank account in a foreign currency also poses a foreign exchange risk. So, where have I been in Iceland, once I got my set of wheels? I feel I’ve seen a lot of Iceland, but I now realize there’s no way I’ll be able to see everything I wanted. 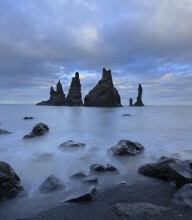 As small as Iceland looks on a map, it’s a big island; the more time I spend here, the more places I want to go. I’ll definitely be back - perhaps next year as a stopover on the way to a mountaineering expedition to Greenland I plan to get together. I’ve pretty thoroughly seen the southern and western areas of Iceland, but I’m just now starting to explore the remote interior highlands, and the northern and eastern areas. If I mention a bunch of places and names, I know you’re eyes will gloss over because you have no connection to what I’m talking about, so I hope the photos will give you a better idea. More are on my flickr albums at flickr.com/wildernessphotographs. Maybe later I will write up some individual trip reports which will be much more exciting. 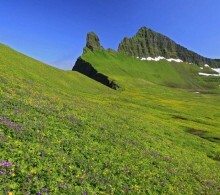 But highlights include the Snæfellsness Peninsula, known for its sea arches, bird cliffs, and mountains, summiting the highest mountain in Iceland Hvannadalshnukur, and hiking the popular Landmannalauger to Skogar trek in 8 days. I’ve summited 4 of the major ice caps here in Iceland, and have utilized good weather stretches by doing a couple 24-hour hikes in this land of no darkness. My younger brother Josiah came out to travel with me on a sudden whim for 3 weeks, and we did an 8 day backpacking trip through the wild Hornstrandir region and across the Drangajökull icecap in the West Fiords, as well as some glacier trips around the Vatnajökull. This was our first time doing some big trips like this together, and I hope we’ll be able to do more of these trips in the future as he gets older and stronger and more experienced in mountaineering. I have just over a month still in Iceland. In the late summer and fall 2009, I'll be back photographing in the Adirondacks of New York State to add to my portfolio of this beautiful location I grew up in. If you're in the region, stop by the Long Lake arts fair this weekend, or the Gore Mt. fall festival in early October in North Creek, to see some of my prints on display there. My photograph of frozen-over Dream Lake in Colorado, USA, recently won in its category in the national juried art show in Cooperstown, NY, so I'm excited to see some of my work being recognized. If you have questions about a particular photo, feel free to contact me.